"...Didier and Carter have come up with a traditional chorus line in the sense that it's clearly set in 1975 and that when, say, Adrienne Storrs first walks out on stage, her costuming tells you that she is playing Diana Morales, she who felt nothing. Storrs is fabulous, as is Natalie Welch, relentless as Val. The older characters like Sheila, Cassie and Zach - richly played respectively by Erica Evans, Laura Savage and Richard Strimer - all come with an aytpical sadness, as if everyone is trapped in the same system, desperately trying to come out intact. And you won't have a seen a more moving Paul than the one imagined here by Alejandro Fonseca." "...Porchlight's production, featuring a fantastic cast directed by Brenda Didier, with choreography by Christopher Chase Carter and music direction by Linda Madonia, brings each character to life in wonderfully high resolution." "...First and always, Porchlight�s high-kicking revival confirms the continuing cause for its docu-tribute: Bennett�s high-strutting, soul-stirring dances are a perfect match for the aspirations this musical will always extol." "...When I saw the announcement that Porchlight was doing "A Chorus Line" on their new stage at Ruth Page, I thought "Can they do this huge dance production on the tiny stage at this venue?" Being a smaller venue in total than that which would host a production of "A Chorus Line" they even had to spread out the press nights, so many had viewed the play earlier this week. Tonight was our night! The opportunity to see this Award winning show, that has embraced the theater community since 1975 in the smallest venue I have ever had the opportunity to see it in. They did it!" "...Dance is notoriously brutal on the body and many careers end before the age of thirty. What makes dancers put up with so much risk and so little pay? A heartwarming monologue delivered by Alejandro Fonseca speaks to the joy, love and self-acceptance that can sometimes only be discovered through the nonverbal exploration that is dance. When the cast comes out for the jubilant finale of "One," no one in the house was without a big, beaming smile." "...This astounding artistic accomplishment is a feather in the cap of Michael Weber's highly respected Porchlight Music Theatre. With a moving book by James Kirkwood and Nicholas Dante, a gorgeous score by Marvin Hamlisch, with lyrics by Edward Kleban, this Award-winning musical is an absolute must-see. There's not one false note or move in this production. In a show of this caliber, that's not only emotionally riveting, but filled with gorgeous music, stunning choreography and talented performers, is quite simply "One Singular Sensation."" "...A CHORUS LINE is about dancing! And Choreographer Christopher Chase Carter doesn't disappoint. His finale is spectacular. Aided by Costume Designer Robert S. Kuhn, the ensemble is pure gold! The energetic, high-kicking, circle of performers is marveling. It's the happiest of endings to see all the chosen and not chosen dancers return for an electrifying curtain call." "...There are a few moments of Porchlight Music Theater's production of A Chorus Line that haven't aged particularly well. In particular, dated and obscure references to pop culture fall flat, even though we know we've been transported back to a dance audition on Broadway in the middle of the 1970s. For the majority of the audience at Thursday evening's performance, who (based on my own very non-scientific observations) seemed to have been already well into adulthood when the show opened some 45 years ago, those moments likely felt as natural as any." "...The fun part of the show are such terrific songs as the signature "One" (singular sensation), sung by the company as they blend in to form a personality-less chorus line, and "At the Ballet" sung by Erica Evans as Shelia Bryant, Liz Conway as Bebe Benzenheimer and Aalon Smith as Maggie Winslow explain and sing that no matter what is happening at home or in their lives "Life is beautiful at the ballet."" 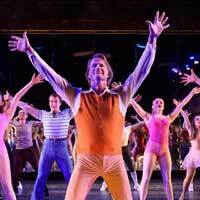 "...A Chorus Line remains, even more than forty years after its debut, the quintessential show about Broadway. It's a show where love of theatre, even more than theatre itself, is celebrated. A good production is always worth seeing, and Porchlight's is excellent. If somehow you've never seen A Chorus Line, this show is a perfect introduction. And if, like me, you've seen it a lot, this show is a glowing reminder of its brilliance." "...Didier cast an all-Chicago ensemble in her 17th production at Porchlight. The relative intimacy of the Ruth Page provides a perspective not often seen in a show that spans two hours with no intermission and only intermittent stage breaks. The inspired performances-a testament to anyone who has ever aspired to make a career on stage-are glorious from the opening vamp to the show-stopping finish." "...With book by James Kirkwood and Nicholas Dante, music by Marvin Hamlisch, and lyrics by Edward Kleban, A Chorus Line is an emotional journey full of twists and turns as we start to unpack the many roadblocks we all face on the quest to meet our dreams - some hopeful, and others heartbreaking. The musical features hit songs including I Can Do That, At the Ballet, Dance: Ten; Looks: Three," One, and What I Did for Love."